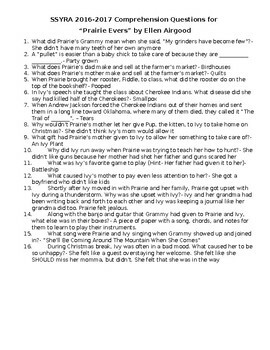 These are comprehension questions that I have created for the book, "Prairie Evers" by Ellen Airgood. This is one of the 2016-2017 SSYRA book titles. I use these questions to prepare my students for the county Quiz Bowl as well as the Book Bowl Competition that I hold at my school each year. Both the questions and answers are attached. Enjoy!